On average you’ll spend 90,000 hours at work throughout your lifetime. Time at work can fly by when you love your career. Unfortunately, though, studies show most employees aren’t happy in their current job roles. Sixty-three percent of workers claim they are generally unhappy and 24 percent of workers say they passionately hate their work. Are you working in a career you love or hate? If you’re not completely happy at your job then it’s time to make a change. You don’t have to settle, success, wealth and happiness are all possible within your life. Wiccan success spells can help you accomplish any of your professional goals. If you’re new to Wicca it can help to have a basic understanding of how to create a sacred circle and on how to center yourself before a ritual. Read on to learn the basics of spell casting along with a professional success spell. Cardinal directions are something you have to understand to perform almost any type of spell. One of the great things about Wicca is its lack of structure. Instead of being a strict religion, Wicca is more of a spiritual practice. However, it’s still helpful to have a basic understanding of how cardinal directions operate. Below we will explain what the cardinal directions are and why they’re important. The four points will give your circle it’s North, South, West, and East direction. Every directional point also relates to two elements. Understanding elements can help you appreciate different types of energies. It’s important to be at peace and have clarity while performing spells or rituals. 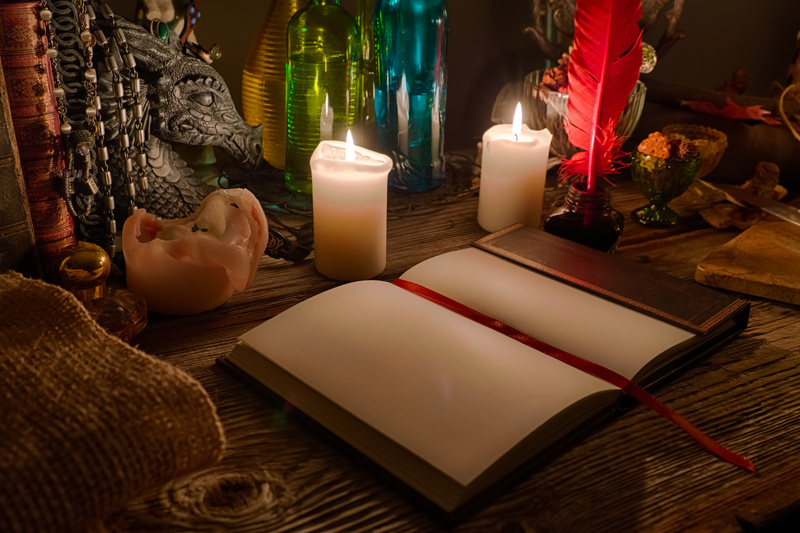 Here are a few ways you can ground yourself before performing any type of ritual or spell. Place one hand on the top of your head. Continue to cover your crown for 30 seconds to one minute. Close your eyes to help yourself focus on allowing your energy to refresh. After 30 seconds to one minute, you should notice a calm wash over your body. You can use your feet to become grounded in any type of environment. Don’t worry about avoiding distractions for this exercise. For 30 seconds to one minute pay attention to the bottom of your feet. What type of sensations are you feeling on your feet? Without speaking find words to describe the way your feet feel. You can ground yourself using your feet while you’re sitting or standing. Taking a cold shower is another great way to recharge your inner energy. Start by taking a lukewarm shower and then abruptly switch the water to cold. Stay in the cold water for 30 seconds to one minute. Over time you can push yourself to withstand even colder temperatures. If you have high blood pressure using cold water to ground yourself might not be the right choice. When you’re performing the professional success spell it’s important you dress in all white. You’ll also need to thoroughly purify your hands by washing them beforehand with water, soap and essential oils. Make sure you dilute the essential oils to prevent them from irritating your skin. You can dilute them by mixing in a non-essential oil like almond oil. After you gather all of the ingredients you’ll need to find a quiet room that doesn’t have any distractions. Prepare the room by creating a sacred circle with the green spell candles. Take your time as you carefully position each of the four green candles. Remember, to make your sacred circle you’ll put one candle at each cardinal point. Next, place your white candle in front of you and your amber incense to the left of the white candle. Now you can gather the bay leaves, fluorite stones, and money. Place all three items into the offering bowl and then place the bowl in front of the white candle. Slowly retrieve your photograph and place it in front of the white candle as well. It’s important to pay attention to your breathing and movements. You should be present, breathing deeply and moving at a slow to moderate pace. The entire experience should be relaxing and almost meditative. Now that every ingredient is in its correct place you can begin the ceremony. Remember, before you start the spell, you have to ground yourself. Take 30 seconds to five minutes to ground and center your inner self. Once you feel calm and ready you can begin lighting the candles. Light every green candle and finish by lighting the white candle in front of you. Once the white candle is light you can use it to light the incense. Now that all of the candles and incense are lit you can wait for one to two minutes. Pay attention to your breath as you perform each sacred step. Your breaths should be deep, intentional and present. After the candles have been burning for a couple minutes you’re ready for the next step. Take the white candle and gently tilt it over your photograph. Allow a few drops of wax to fall onto your picture. Using both hands pick up the offering bowl. Hold the bowl firmly in your hands and focus on your photo. When you’re focusing on your picture your eyes can be open or closed. After reciting the incantation three times find a place to sit. Silently sit down and visualize yourself financially free. Money is no longer hard, instead, it comes easily to you. Imagine how light you feel as every single financial burden goes away. Picture people congratulating you when you find out you got the new job. Hold that happy light feeling and experience it for a few minutes. Slowly stand up and visit each candle in your sacred circle. Focus on the vision of being financially free as you extinguish each flame. Always start with the green candles and finish with the white candles. Leave the incense to continue burning until it’s all gone. Practice thinking about the light happy feelings the next time you start to think about professional success. If you catch yourself worrying about professional success, recite the incantations. While you’re reciting the incantations focus your thoughts on positive futures. Once again see yourself being financially free, happy and successful. Success spells are a powerful way to transform your life. Psychics Directory would love to help you along your life’s journey. We have articles about mythology & legends, paranormal, tarot, astrology, psychics and more! What have you been wanting to learn more about lately? Perhaps you’ve felt a calling to reach out and speak to a psychic personally. You can use our website to find quality, hand picked phone psychics, tarot readers, and astrologers. You can also find chatrooms online to discuss different aspects of the paranormal. Enjoy searching our online directory and please come back to visit us as much as you like!